Nature will absorb you into its system very readily and works heartily to do so – it will absorb you right into its food chain, if it can – this is a post about nature’s strength, the soundness of it, the vitality and robustness of Life seen and witnessed firsthand, but I should also point out that it was surprising to me purely for the backdrop of misinformation I had come from, fed to me without my awareness via television and politics and fear-mongering (no, I’m not going to wander into politics, I’m merely pointing out that I was taught to be fearful for the future, for humankind, for animals and nature and all the things we’d been told humankind was “destroying” and why it was such an upbeat thing to find it wasn’t so). When did I wake up to just how powerful nature is? After moving out into the wild, pretty bloody quickly. We wanted to enjoy the wilderness because we love nature. 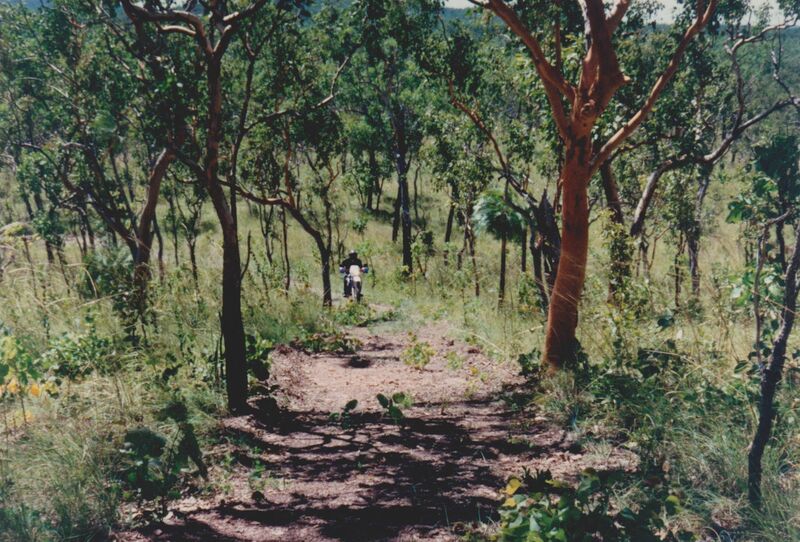 That’s why we moved onto a wilderness block, so we could live there in a tiny section of it, and enjoy all the beauty and the wildlife of the rest of it with most of our 250 acres in Australia’s Top End (Northern Territory) left completely undisturbed. Which is what we did. 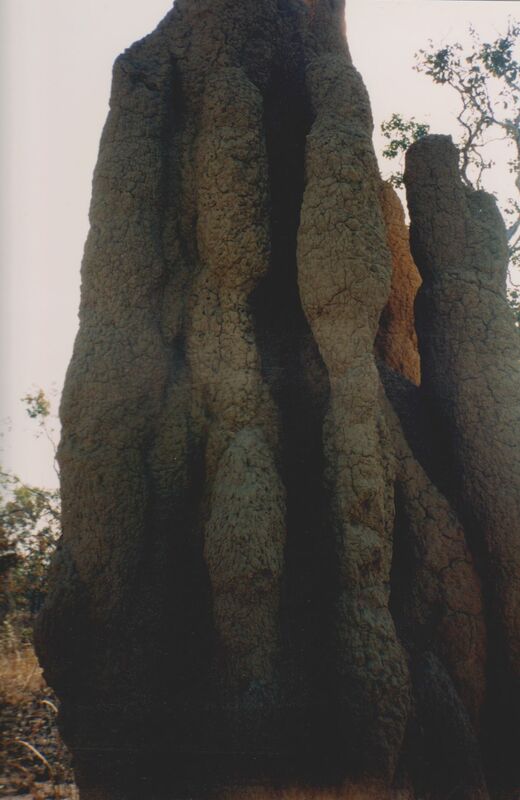 The picture at the top of the post is a termite mound, and no, I wasn’t lying on the ground or crouched low to get that shot. That was the size of it. Here’s another (below). As time went on, we erected a small garden shed so we could take our belongings out of storage and have them with us. Mostly, this was books. As the floor to the shed was dirt, we put in some protection to keep insects out, and, while this sounds like a huge sin, it turned out to be completely inconsequential. We put a base of used oil down, figuring anything finding that would turn away. Then covered it with tin. It was the best we could do. Well, Nature laughed at our feeble attempt and before the week was out the termites had moved in and demolished half our books. I mean eaten. Gone. We saved what we could, but that was the end of that idea. When we looked under the floor tin, the oil was gone – something had eaten that as well (I’ve since read of organisms in the sea which eat oil spills, cleaning them up – Nature is amazingly good at looking after herself). 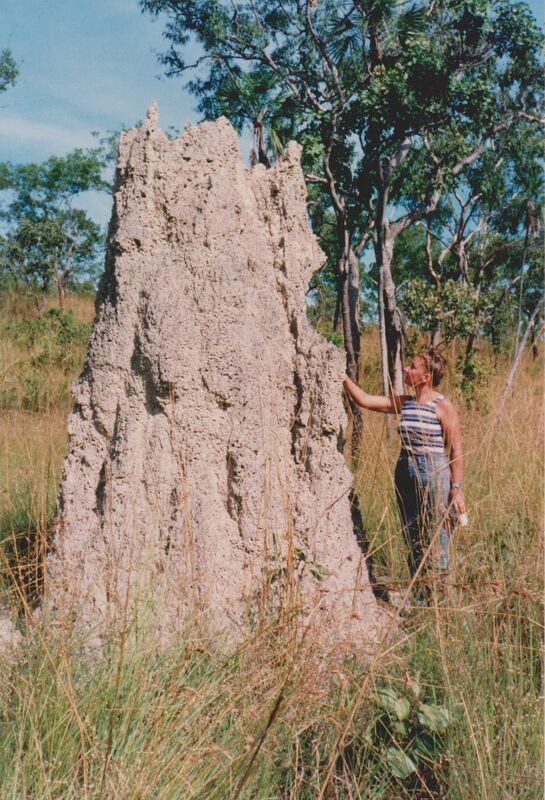 The termite mounds pictured in this post were on our land. I found them very beautiful. 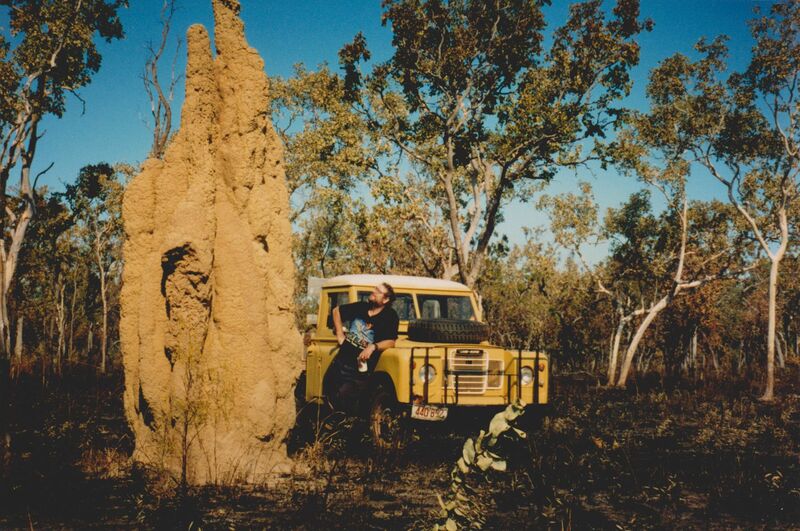 The termites were incredibly fast and voracious. They could take a tree in 24 hours if they were intent upon it. They ate an assortment of weird things. The tyres off the caravan, for instance. They even managed to bore a hole through the very thick, very durable battery casing and right into the battery. I never figured out why, it’s not like they were short of food. Nature sprang back all over the place. 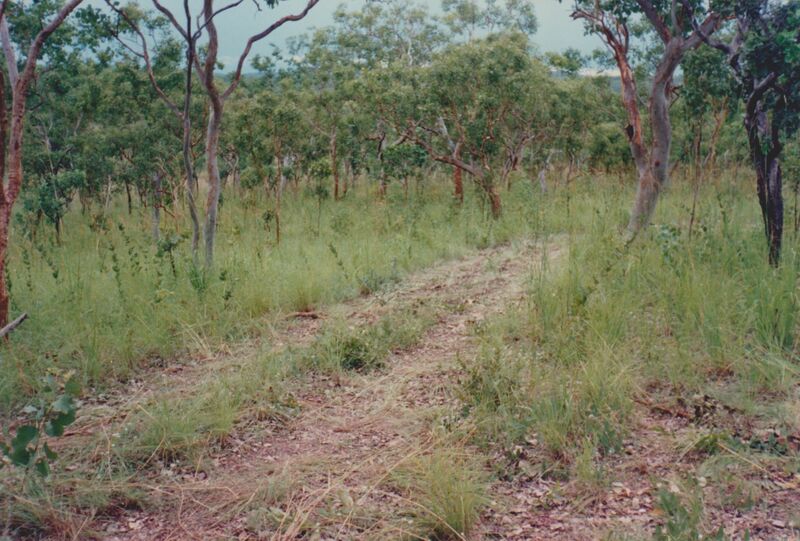 After a very short time, the driveway I had put in looked like this (above) and the lower road like this (below), with grasses and bushes popping up again, so clearing the driveway was a regular chore. The rain also ate into it. Life sprang back after wildfires, too with creatures big and small managing to evade it and trees surviving perfectly well to sprout new shoots and come green again. But more on that tomorrow. Point is, if you’re living in a city, you’ve only got television to go by and someone else’s point of view, which may or may not be accurate. If you go for a drive in the country, it doesn’t show you or teach you anything, you’re just seeing a glimpse of it as it is at that moment. But, by God, living out there, you soon know how tough it is and how majestic it is and just how BIG it is. You very quickly learn, too, that not only are we part of nature, we are a very small part of nature and we will never rule this planet. I find that a very comforting thought. I don’t know that being a country-hearted soul can ever get out of the blood, once there. The city would wear me out, I think. I hope you love it, where you are. I’m currently right on the edge of a very small country town, so we have a semblance of privacy and countryside we can look at, but the people still feel too close and we yearn to get back out into something wild, even if it’s not as wild as that.